Sir David Attenborough joins the campaign to save Jankowski’s Bunting! 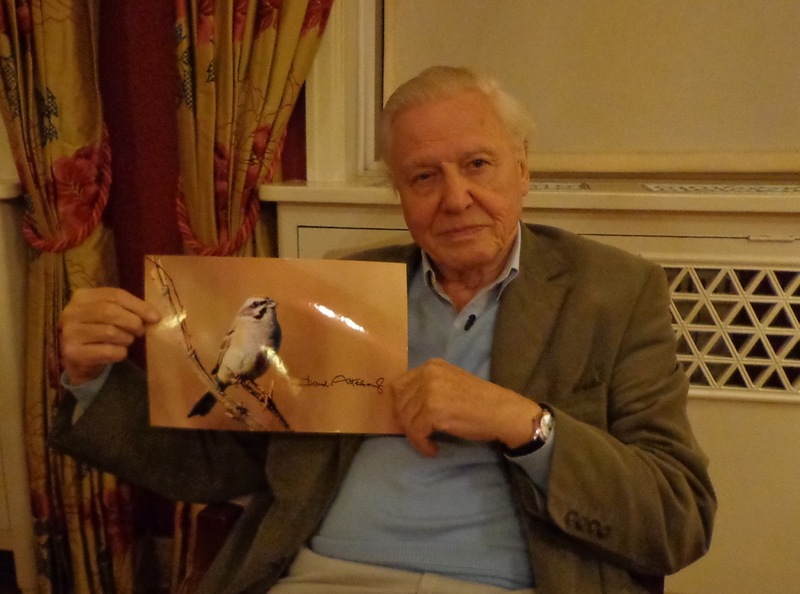 Sir David Attenborough supporting the campaign to save JANKOWSKI’S BUNTING. If I was asked to name just one person who had been the biggest inspiration to me over my lifetime, I would have no hesitation. Sir David Attenborough. Vivid in my memory from a child to the present day are series such as Life on Earth, Living Planet, Life in the Freezer, The Life of Birds and, more recently, The Blue Planet and Planet Earth. The significant percentage of my DVD collection that is made up of natural history documentaries narrated by Sir David is testament to the influence he has had on me. In my view he is simply the greatest broadcaster and communicator of conservation that has ever lived. So, as you can imagine, it was with huge excitement that I learned Sir David was to visit Beijing as part of a trip to China to film a new series on the origins of vertebrates. At the age of 86, he maintains an enthusiasm and passion for the natural world that is impossible not to admire. His visit was a golden opportunity to discuss the plight of JANKOWSKI’S BUNTING and, of course, he was only too happy to lend his weight to the campaign. Sir David is already a Species Champion for the Araripe Manakin under the BirdLife Preventing Extinctions Programme, so he knows how vital it is to protect our biodiversity and also, importantly, what is needed to save a species from extinction. You too can support the campaign to save Jankowski’s Bunting by donating here. We have so far raised over GBP 1,200 towards a target of GBP 10,000. We are confident that, with modest resources, this bird can be saved. How cool would it be to think that you were one of only a handful of people in the world that helped save a species from extinction? Posted on January 28, 2013 January 29, 2013 Categories UncategorizedTags BirdLife International, Jankowski's Bunting, Sir David Attenborough2 Comments on Sir David Attenborough joins the campaign to save Jankowski’s Bunting!